Tate Britain’s Winter 2018 exhibition brings together paintings, sketches, stained glass and tapestries by Victorian artist Sir Edward Burne-Jones. I went to see it last week. Burne-Jones didn’t fit the usual pattern when it came to Victorian artists. He was born and grew up in industrial Birmingham and he went to university to study theology rather than to art school. It was there, however, that he met William Morris and a life long friendship began. 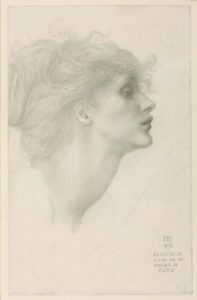 Under Morris’s influence and that of Rosetti he abandoned his studies and decided to become an artist and one of the last members of the Pre-Raphaelite Brotherhood, starting as a water colourist. The paintings in Room 1 are indicative of his output during this period. I stand in awe of a technique which can depict the luscious fabrics in the small pictures of Clara von Bork and Sidonia von Bork. Likewise his astonishing skills as a draughtsman, as shown by works in Room 2; not just the intricate and highly patterned pen and ink works, but some exquisitely beautiful and expressive drawings like Desiderium or the portrait of Jan Paderewski (the latter in a later room). These drawings, and many of the figures in the paintings, contain a remarkable tenderness. I liked too the works in stained glass and tapestry. 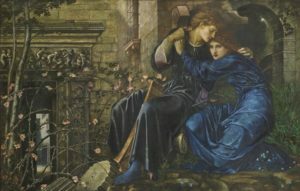 Burne-Jones was a co-founder of Morris & Co, so it is entirely right that his work as a decorative as compared to ‘fine’ artist was included in the show. He made no distinction between the fine and the applied arts. The constraints of stained glass or tapestry bring out the best in his art I think, the use of line and bold colour in the stained glass and the intricate pattern like the amazing flowers in the tapestries This was sometimes found in his earlier paintings, but these grew increasingly monochromatic and melancholy as he grew older. He is culturally democratic in his painting, incorporating beggar maids as well as characters from myth and legend and having his pictures shown in cultural centres for all, not just to rich patrons in West End galleries. Women play an important role, often sexually charged and predatory or sinister. It is right too that he paints beauty – it was one of the tenets of the Arts & Crafts movement that beauty should be married to function and brought into the homes of everyone. I confess, however, that for this viewer I wanted a greater range and more differentiation between the beautiful, elegant and often fey females which people Burne-Jones’ paintings. In vain I looked for a depiction of a woman or girl laughing, or one with thin lips. No, they all conform to the artist’s idea of female beauty, he doesn’t paint women, he paints what he wants a woman to be. Rather like the beautiful ruins in ‘Love Among the Ruins’ or the briar-bound castle in ‘Briar Rose’. Even the dirt is scenic. Everything has to be. I was unaware of Burne-Jones’ influence abroad which, the exhibition tells us, came after the big Grosvenor Gallery pictures especially King Cophetua (left). One can see how his devotion to decoration influenced later British artists, like Eric Ravilious and Edward Bawden, though how much that is really the influence of the Arts & Crafts movement generally, rather than Burne-Jones specifically, I couldn’t say. This is a fine exhibition and definitely worth visiting, though I wonder if such a concentration of Burne-Jones paintings does the artist a disservice. No one was meant to look at all of these together and, for me, the cumulative effect was of admiration for his skill but a disassociation from the works. The exhibition runs until 24th February 2019 and costs £18 to enter (£17 concessions). This entry was posted in Art, Culture Vulture, London and tagged Art, London, Worth a visit by juliej. Bookmark the permalink.